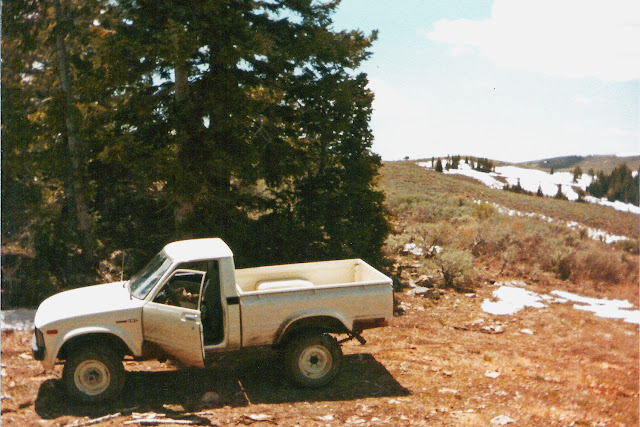 Before Great Basin National Park came into existence in 1986 it was simply National Forrest Service land. 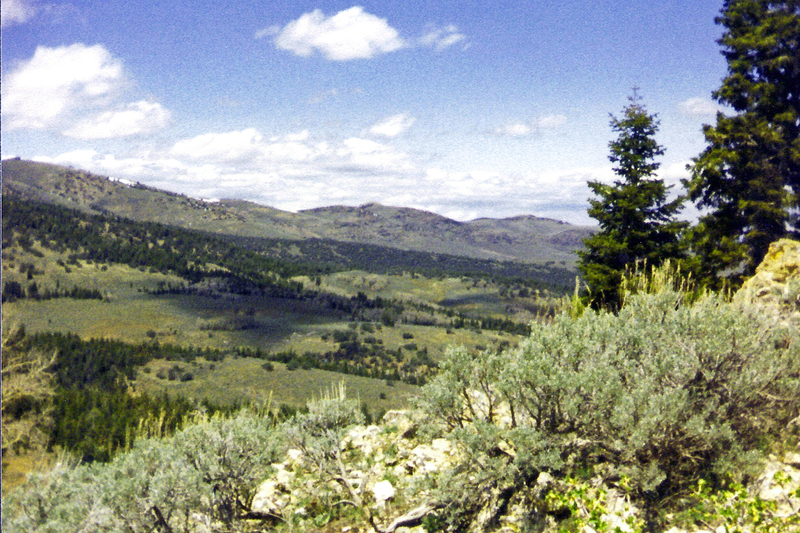 The park lies within the Snake Mountain Range just east of Ely, running along the Nevada-Utah border. Lehman Caves was privately owned, but creation of the national park brought the caves into the federal fold. While I am thankful the park is protected, national park status creates a higher level of interest. But the remoteness of the park has kept the throngs away so far. 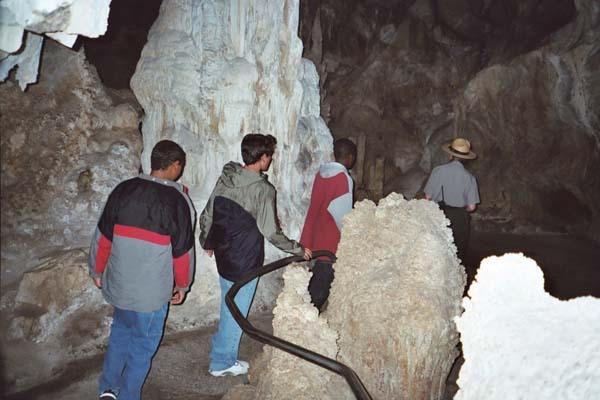 I first visited the Lehman Caves when I was in college. My memory is a little fuzzy; I thought there were four of us on that first trip but I can only recall the names of Doug Tueller and Kevin McGoohan. 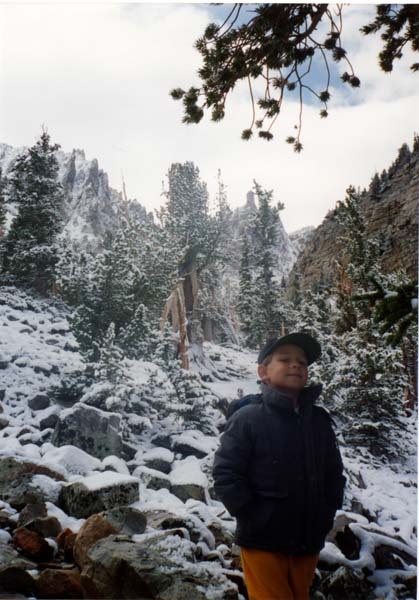 I was not a fisherman at that time; we simply went to escape city life and appreciate the grandeur of Wheeler Peak (13,062 feet) and the accompanying Snake Mountain Range. 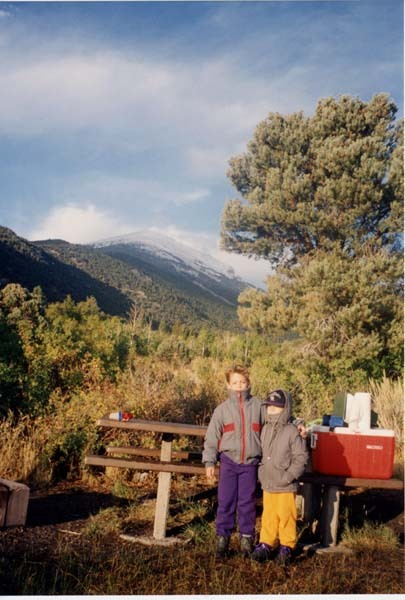 We camped in the Upper Lehman Creek campground (around 7,800 feet), and hiked the Lehman Creek trail to the Wheeler Peak campground (9,950 feet). It was a rigorous hike with Tueller in the lead; an eight-mile round trip with 2,150 feet up and then back down. Of course, we toured the Lehman Caves which was under private ownership and operation at that time. I returned another time with McGoohan during spring break, and the highlight of the trip was the hour-long tour we received in the caverns, as we were the first and only visitors of the season. Still another time I recall driving up the morning after attending UNLV graduation parties in 1978 with a fraternity brother (who’s name escapes me). 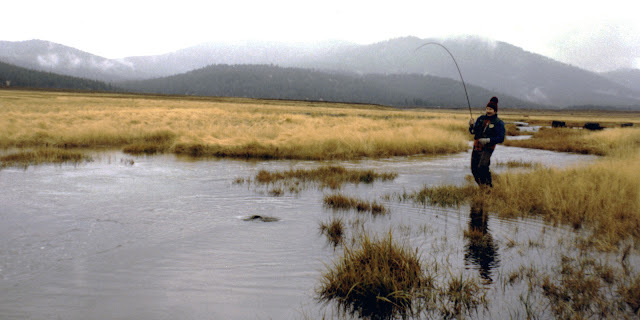 I recall still another trip after I began fly fishing. Although I’ve never fished the alpine lakes (Baker and Johnson hold Bonneville Cutthroat Trout), I have fished Baker Creek. I intend to return soon to try fishing the creek once again. I estimate I have visited Wheeler seven or eight times over the past thirty years. It has a unique beauty all its own. It is the second highest peak in Nevada (Boundary Peak in the White Mountain being the highest at 13,143 feet), and it is an attraction for climbers with its breathtaking cirque at the peak. I believe it is the most photographed and recognizable peak in the whole state of Nevada. ﻿﻿Another attraction of Wheeler is its bristlecone pines. Bristlecones live over millennia, not centuries. The Wheeler Peak grove has kept its grip on life for two to three thousand years, with some trees living even longer. In fact, the oldest living thing ever discovered was a bristlecone pine in the Snake Mountain Range; it was cut in half – killed – in order to determine its age which was 4,950 years. 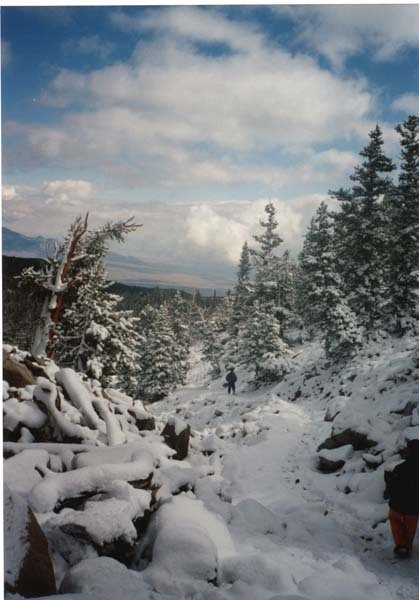 The park has several groves of bristlecone pine, but the Wheeler Peak grove is unusual in that it grows on a glacial moraine consisting of quartzite boulders. Most groves grow on limestone or dolomite. 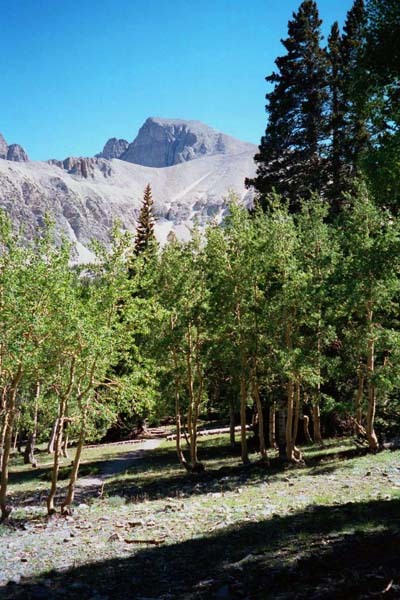 The northeastern exposure of the Wheeler Peak grove is also unusual as most other groves have a generally southern or western exposure. The Lehman Caves are an attraction all on their own. The caves in Wheeler are one of the best places to see rare shield formations. Over 300 shields are known to exist in Lehman Caves, more than any other cave. 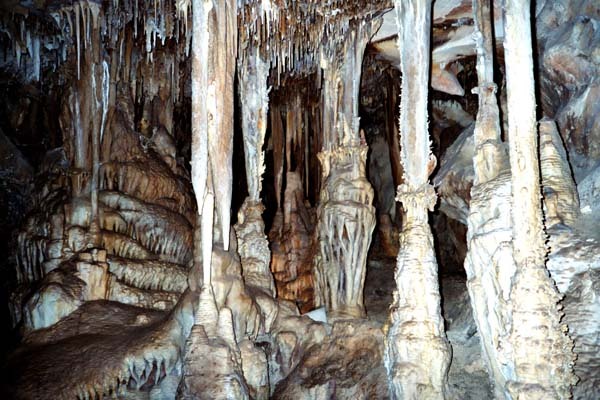 The cave is profusely decorated; stalactites, stalagmites, helictites, flowstone, popcorn, and other formations cover almost every surface of the cave. Caves can tell us about the history of the earth. Information about past surface climates are preserved in the layers of cave formations, and much can be learned about natural history from the "treasures" in old pack rat middens (i.e., dunghill or refuse heaps). Thus the cave can tell us a lot about past climate changes and their effects on plant and animal communities. Water, geologic forces, and climatic changes combined to form Lehman Caves over a period of millions of years. The Snake Range has numerous creeks flowing into the Snake Valley along the state border (Strawberry, Lehman, Baker, Snake, and Big Wash). 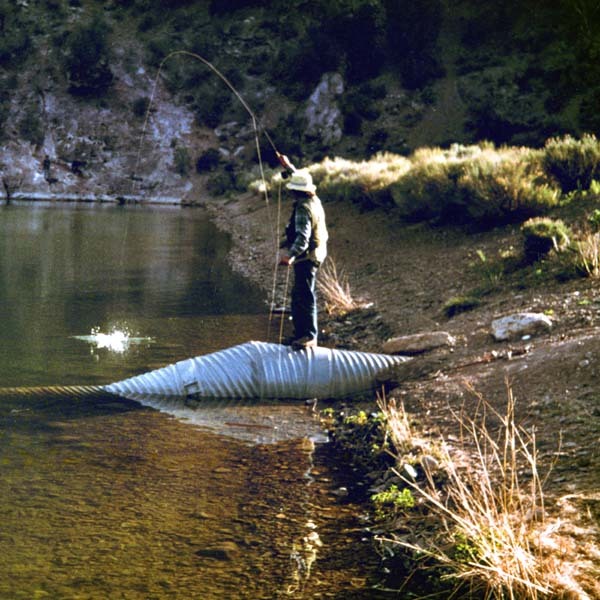 Although I’ve only fished Baker, on various occasions Doug, Tom, Brian and I have fished nearby Silver Creek Reservoir that flows from Mount Moriah to the north (the northern portion of the Snake Mountain Range). Wildlife also abounds, with mule dear and rocky mountain bighorn in the mountains, and pronghorn antelope in the valley. 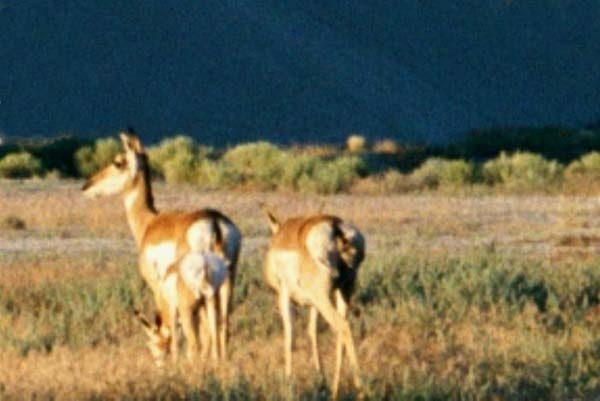 I recall a trip with Brian and Evan wherein we had a buck in velvet eating in our campground, and then saw two pronghorns with a fawn just outside Baker. The private land just outside the park contains lots of cabins. One of my favorite memories driving up the Lehman Creek road into the park is the “art” hung on the fence as you drive through the private areas. These people really have a sense of humor. Lehman Caves, June 2003, with Brian and friends Jeremy and Delano. Note Columns above with stalactites and stalagmites, and flowstone shields to the right. Pictures do not do accurately portray these awesome structures. 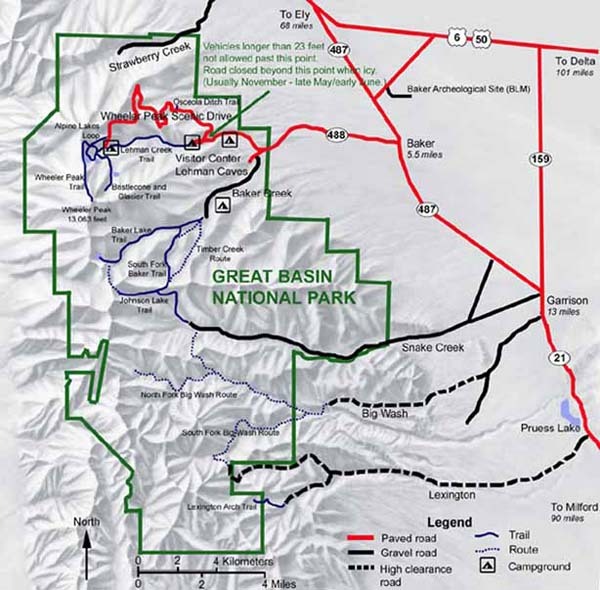 Above is a 3-D topographic map of the Great Basin National Park. It is just off state highway 6 which branches off US Highway 95 to the west. as does plentiful wildlife. The park is well worth the visit. 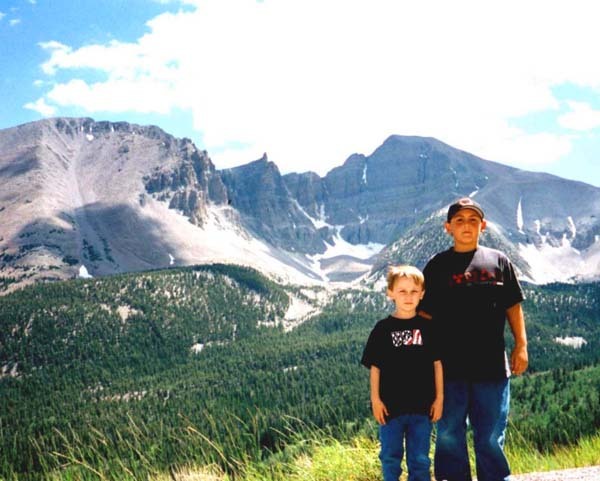 My brother Neal is responsible for cultivating my interest as an outdoorsman. I suspect the seeds were planted as a boy growing up in Hooksett, New Hampshire, but someone needed to water them. 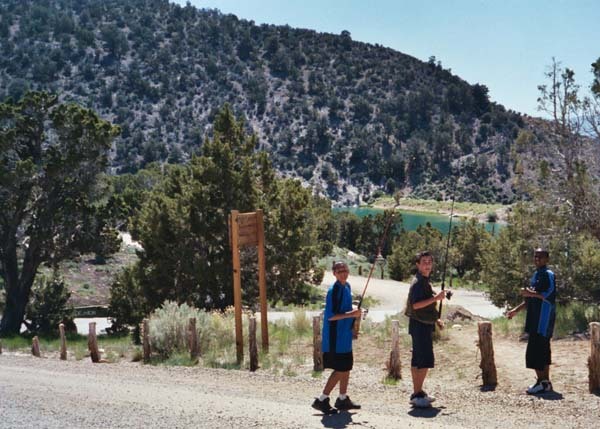 In my early teens he took me on my first fishing trip to Kingston Canyon south of Austin, Nevada. He gave me a cheep, ultra-light spinning rod, lures, and a canvas creel and set me loose after just a few minutes of instruction. Neal was never long on patience, and he never really offered to teach me the art of fly fishing. In college I bought several books on fly fishing, and after years of dreaming about it I finally taught myself. 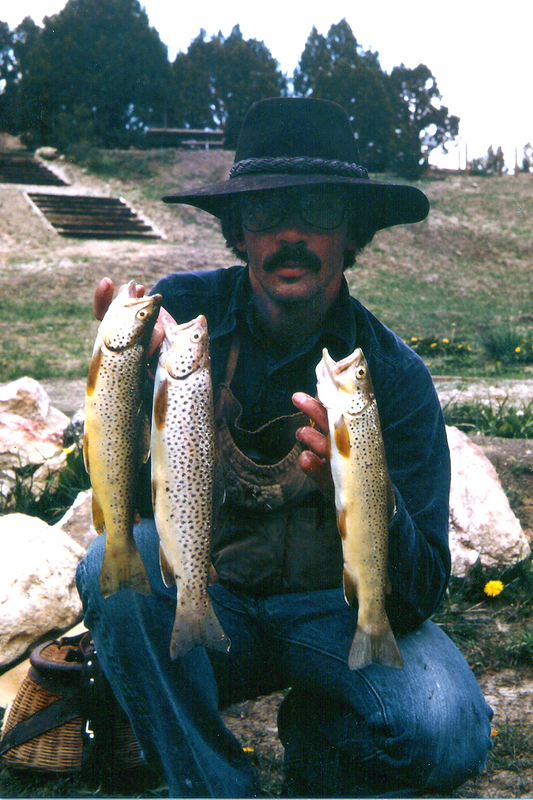 After graduating from college in 1978, I badgered Neal into a Utah fishing trip. I was still very much a beginner, and I wanted him to share his knowledge of both the sport and the places nearby where he plied that sport. I think Neal finally decided that my graduation was as good an excuse as any, so we set off for Beaver, Utah with thoughts of fishing the high mountain lakes in Fish Lake National Forest. Upon arriving in Beaver we unfortunately learned that the Utah season did not begin until June 1, so we could not fish. 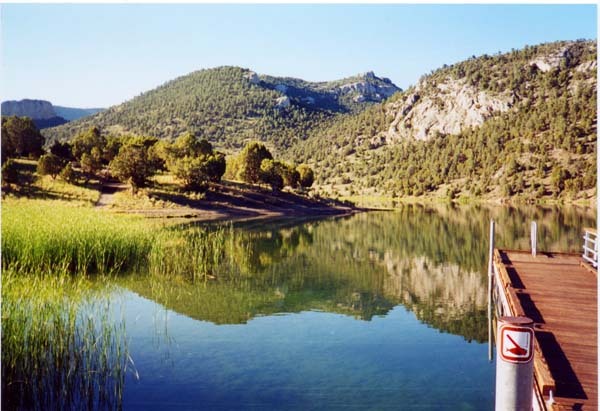 Neal suggested heading west on Highway 21 to Cave Lake near Ely, Nevada. That fortuitous decision turned out to be brilliant. In those early days, we killed everything we caught. Catch and release had not really been discussed much at that time. The objective was to come home with the ice chest as full as we could get it. Cave Lake filled that bill splendidly. In 1978, Cave Lake was under-utilized. Although just twenty minutes outside the town of Ely, it was not well known down south, or at least the southern population of potential fisherman was not what it is today. 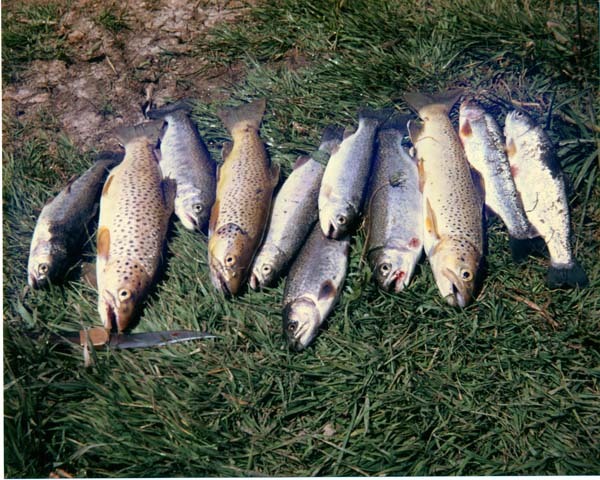 Although they stocked the lake with rainbow trout, Neal was aware that there were holdover populations of brown trout that were reproducing in the feeder creek. We must have timed our visit just right as the lake was well stocked. Even as a novice who fished dry flies exclusively, I caught many stocked rainbows. However, the real excitement was catching the brown trout, or "brownies", on dry flies. In one instance I recall standing on the boat dock watching this large (large to me at that time was anything over thirteen inches) brown sucking mayflies from the surface. 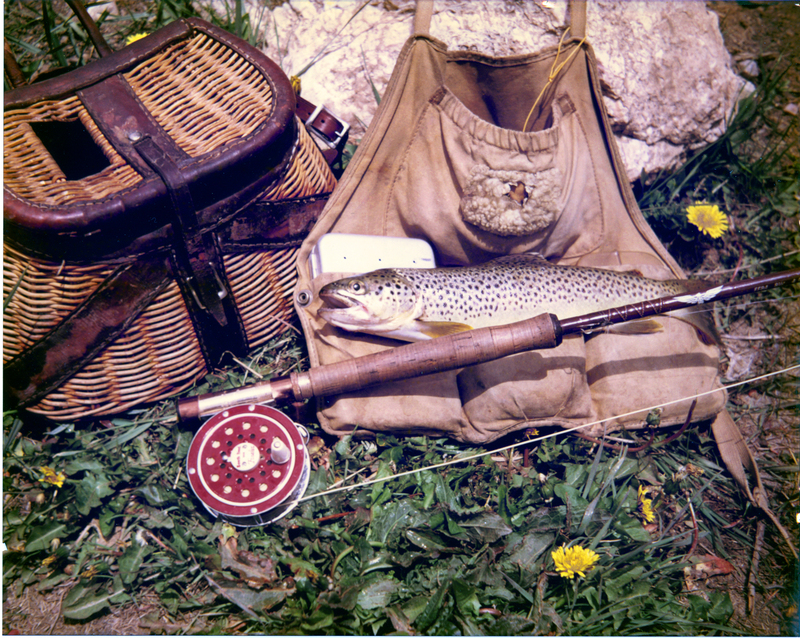 I was fishing with my newly constructed seven-and-one-half foot fly rod, a rod of my own creation. I quickly cast a dry fly into the path of the cruising brown. I watched as he leisurely approached, opened his pink mouth, and sucked in the fly. What an awesome experience for a twenty-one year old novice fisherman. That was an addicting event. 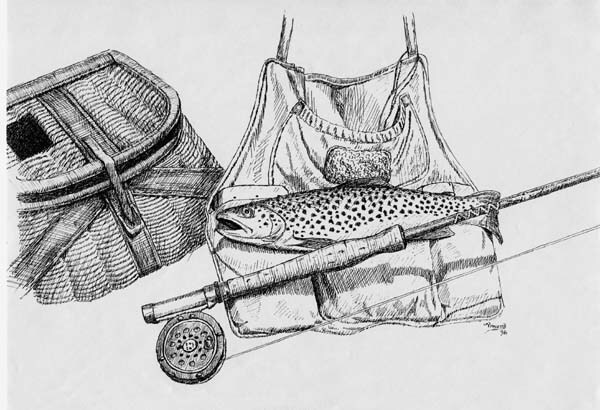 Neal also caught several good size brown trout, and one of the pictures we took with Neal’s creel, rod, and bib arranged around the trout was composed so well that I drew the picture in pen and ink in 1981. I returned to Cave Lake for a solo visit in the fall of 1980, but only caught two browns. I did get a strike from a brown on a dry fly, and that trout could have gone twenty inches and three pounds easily. I thought I had set the hook, but as the brown leaped clear of the water it pulled out. Disappointed, I retrieved my line and examined the hook. I felt like an idiot when I discovered that the hook point was bent (probably from a sloppy back cast bouncing off a rock), and that it never set into the trout’s jaw, but rather had been pulled straight as I attempted to set the hook. That was a difficult lesson to learn at age twenty-four. My next visit was with Doug and Tom in 2000; a maiden voyage for my new Dodge Quad Cab. 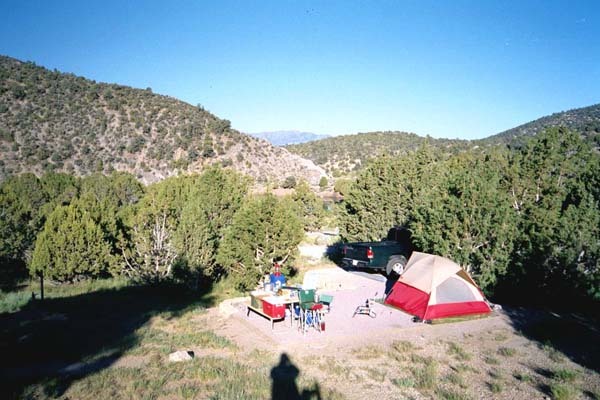 We camped in Cave Lake, but visited Silver Creek near Great Basin National Park and Illipah Reservoir on the way to Eureka, Nevada, as well as a long jaunt up to the Ruby Marshes. 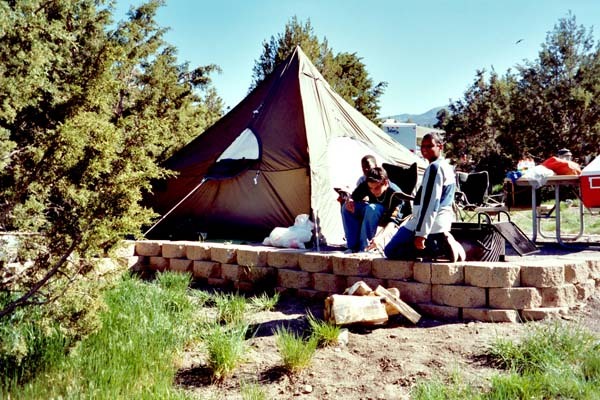 Although Cave Lake served more as a base camp on that trip, it became known as “Skunk Camp" due to a visit from a nocturnal skunk on the second night. Tom had become ill in the middle of the night and vomited just a few feet from the tent, which is not adequate distance to safeguard the camp from pesky scavengers. Sure enough, before we even re-entered the tent along came an ambling skunk which consumed Tom’s remnants right before our eyes. Tom was a good sport about it, and it was interesting to watch the skunk; thank goodness he never left a calling card. 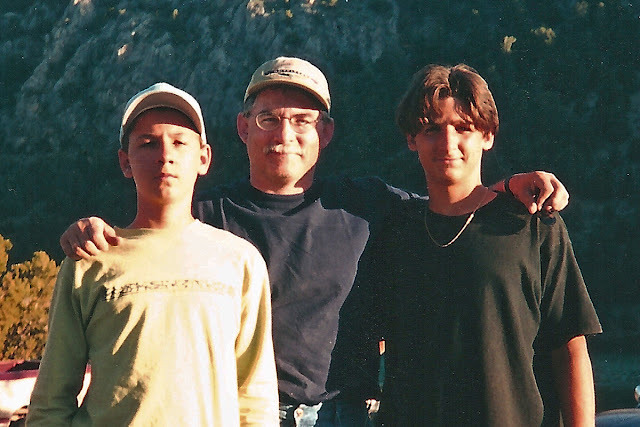 The most recent visit to Cave Lake was in 2003 with Brian and two of his buddies. That was more of a camping trip than a real fishing trip, as all three had to be assisted constantly with tying knots and unraveling “bird nests”. 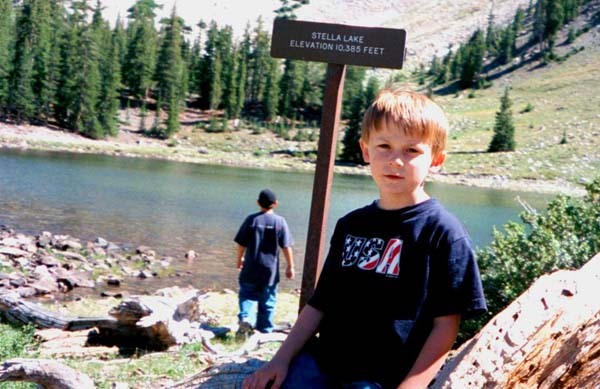 Still, it was a fun trip for the boys and included the obligatory Great Basin National Park side trip. Splitting time between the three of them was fine, but it would have been better had I spent more time just with Brian.